The Circupool SJ-40 is the SJ-20’s next size up. It is designed to deliver ultimate reliability and simplicity for your swimming pool. This complete salt water pool system is designed for pools with up to 40,000 gallons water capacity. This chlorinator is manufactured in the US and installation is simple and can be done DIY if you’re handy enough. The SJ series can operate on 110 or 220 volts which is easily switchable during installation. As default, the unit will ship with 220v switched on, however the instructions cover how to change it to 110v. The cell is made out of “high-output” titanium housed in clear material to allow perfect visibility of the chlorine production. The Circupool SJ-40 is constructed from heavy duty materials for durability and extended lifetime. The unit is designed to automatically keep your pool crystal clear, producing luxurious pool water that is gentle to eyes, skin and hair all year round. Any need for chlorine is eliminated. 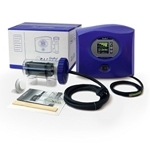 Like most modern chlorinators, the SJ-40 features self cleaning functionality which is achieved by reverse polarity. As mentioned, the cell housing is clear which allows you to very easily and quickly inspect the condition of the cell plates. In the case that there is some calcium build up on the plates, cleaning is required and it is easy to remove the plates from the housing and submerse in a cleaning solution. Daily operation of the unit is automatic and comes with a simple, user-friendly control unit. The control unit isn’t fitted out with loads of unnecessary buttons, dials and lights. 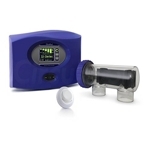 You’ll need to connect this unit with the pump so that it makes use of the pump timer. It doesn’t have it’s own timer so it needs to run off the pump’s timer which isn’t an issue as the chlorinator can only work when the pump is running anyway. The product features a boost function for super-chlorinating which the manufacturer calls 125% True Boost Mode. The Circupool SJ-40 chlorinator comes with a very respectable 5-year warranty and manufacturer Circupool will not penalise you for carrying out the installation yourself unlike other manufacturers who force you to use qualified installation technicians as a condition of their warranty. Reviews on Amazon for this product are very positive – in fact finding a negative review is quite difficult. At time of writing, this product was the third best selling chlorinator on Amazon.